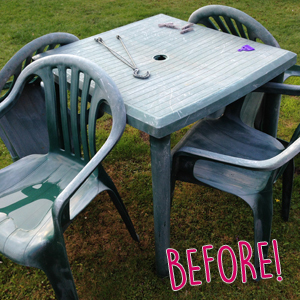 DIY Old Garden Furniture Back to Life! Does this picture look familiar?? 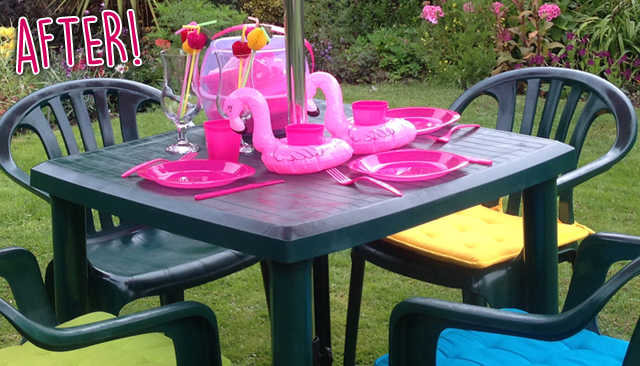 Hasn’t everyone got a faded set of plastic table and chairs in their back garden somewhere? My parents had a green set from the 1990s, it has lasted decades. But the colour had faded, there were terrible white marks all over, cobwebs in the corners, and generally they looked unloved – sound familiar?! 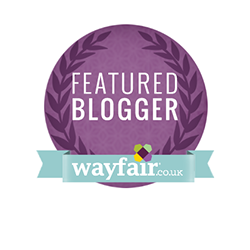 Well I came up with an easy makeover for Wayfair.co.uk – to make them look brand new using Plasti-kote Plastics Spray Paint (external use) and adding a tropical twist! ← It’s okay to have a nothing day indoors!